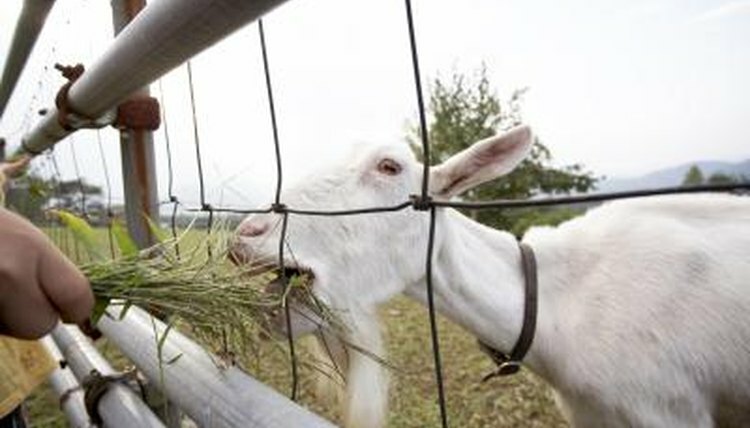 A hanging wire goat hay feeder will help prevent your goats from wasting hay by dropping it onto the ground, trampling it or using it as a litter box. Hanging feeders are also difficult, if not impossible, for even the most determined goat to climb into. A hanging wire hay feeder will save you money on forage and make sure your goats are getting the full benefit of all the groceries you have purchased for them. Divide one of your 8-foot-long boards into 6-foot-long sections using your measuring tape and pencil. Mark each section off and then use the electric saw to cut each section so that you have six individual pieces of wood plus 2 leftover feet of board. Use your electric saw to cut the end of each section of wood at a 45-degree angle. Place another board so that it is sitting on its narrow side. Use hammer and nails to attach two of your foot-long sections of wood to either side of the ends of the board, creating a "V" shape. Do this to both sides of the 8-foot board, creating the base of your feeder. Nail the remaining 8-foot boards lengthwise across the tops of your V-shaped base. Nail your remaining 1-foot boards across either end of the structure, attaching the two sides of your feeder to one another. Screw an eye bolt directly into the center of each of these top end pieces; this is where your chains will attach so your feeder can hang. Cut 10 feet of wire fencing off your roll of fencing with your wire cutters and place it lengthwise inside the frame you have just built. The fencing should completely cover the openings in the bottom sides of your "V" shaped feeder, leaving the top side open. Use fencing nails to fasten the wire into place inside the feeder, covering all open areas with wire and securing wire at both the top and the bottom of the structure. Use your wire cutters to trim away any excess fencing.  Wire feeders are only good for feeding hay; grain will slip between the wire and fall onto the ground. If you want to make a hanging feeder for grain, you should substitute the wire for a solid material, such as plywood.